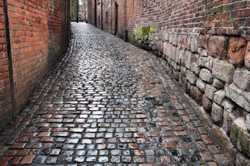 Daly began with humble roots in 1907 as a plumbing and building contractor in Coventry when these cobbled streets were the norm. As the city grew, so did Daly, as we forged ties with the booming manufacturing and automotive industries of the Midlands’ golden era. As the years went by, the Daly name became synonymous with quality building services, as the company provided bespoke service installation solutions to internationally known brands like Jaguar, Peugeot, British Leyland, Rolls Royce, Coventry Climax and Massey Ferguson to name but a few.